When you feel an ache or pain, what’s the first thing you do? Pop a pill, see a doctor? Modern medicine helps but is it the only option? Alternative therapies, although rich in history, are not really the typical “American way”. But what we don’t know could be hurting us. Your low back pain, knee, thigh or hip issues, depression, digestion or reproductive health concerns could be relieved by reflexology. 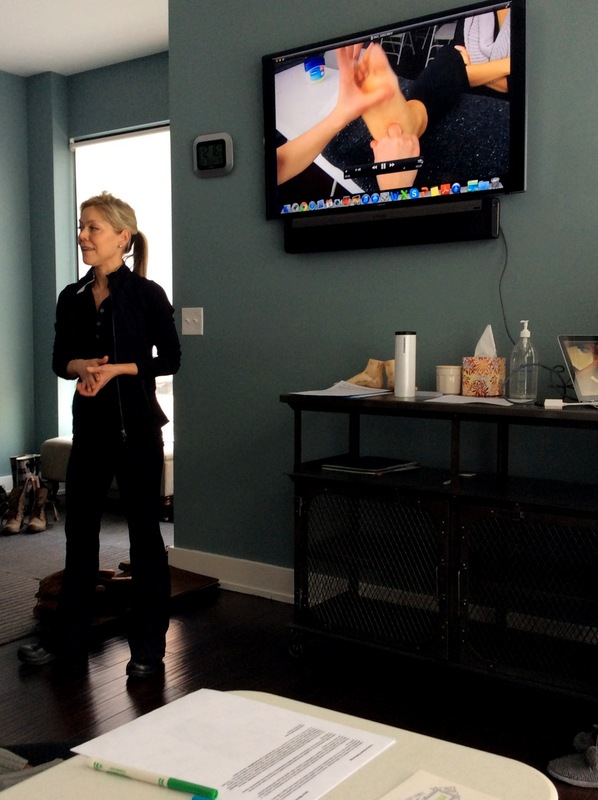 Recently, we attended an Intro to Reflexology class hosted by Jane G. Doyle (President of YouHealYou and author of Expect Your Miracle) and taught by Sarah Preusker (board certified reflexologist). Ms. Doyle actually started You Health You based on her own experiences with chronic pain and her journey to heal herself without the crutch of never ending pills. When we settled into the class, we realized that we would literally be doing “hands on” foot work. So what is reflexology? It is a thumb and finger finger pressure technique on the feet, hands and ears which purportedly has an affect on every part of the body, inside and out. During the workshop, people were partnered up so we braved each other’s lack of pedicures, brushed off the toe fuzz and got down to business. We began with exploring of the bones in the feet. It was intriguing to feel how each toe has different joints and each bone travels into the base if the foot. After thoroughly wiggling our partner’s toes and meandering around the joints (we had a continual flow of quizzical looks on our faces while doing this), it was time for foot art! Sarah led us through which parts of the foot connected to parts of the body. As we followed along, we shaded washable marker diagrams on each other’s tootsies to signify different systems: digestion, reproduction, heart, and more. We had to skedaddle a little early for work so we didn’t get to stay for more technique assistance and deeper instruction on which parts of the foot could be pressed to relieve issues. So why attend? The class was easy to follow, definitely enjoyable and Sarah was a nurturing practitioner. She made rounds throughout the class and offered assistance to each group. It was also relaxing (for those of you who don’t have foot aversions) to use/have pressure on the feet. Sarah noted once you learned the proper pressure for reflexology, you could enlist your partner, foot friendly friend or family member to put the vice grip on you. 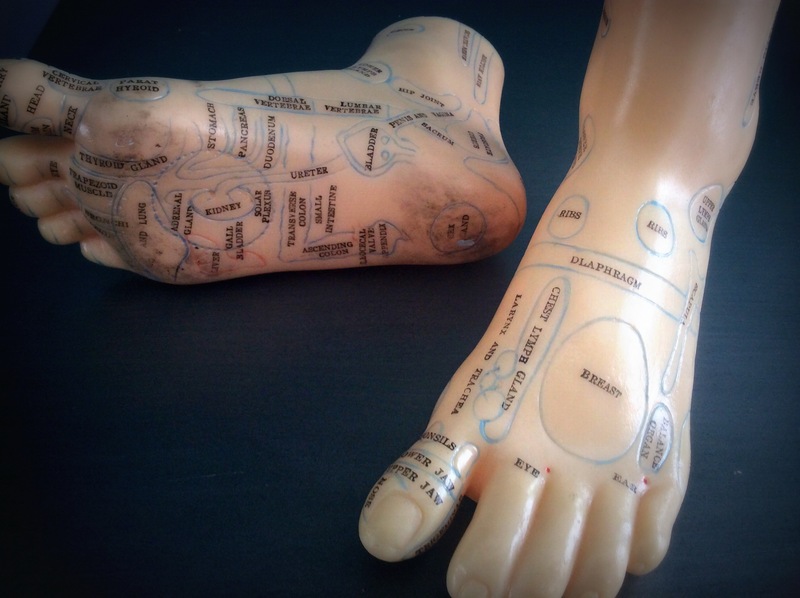 So the question is: does Reflexology work to reduce pain, anxiety or illness? Kate had been having sinus problems and the matching foot area was tender and responsive. Coincidence? The ped-jury is still out. Various studies show mixed results so proceed with caution and look for a reputable practitioner. As we got lost in the toe-ment (hahahah pun! ), we were beginning to think it was time to change careers to become reflexologists…but then we realized we were more just touchy squeezy foot amateurs. So what about you? Would you like to have an alternate means to improve your health? Check out the next You Heal You Reflexology event at Tribe Healing Arts on Sunday, June 22nd! Thanks to Christina Giordano for the invitation!